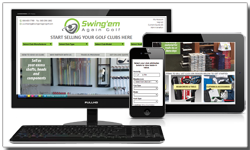 You may price your club inventory using our on-line club quote engine or have us price it for you. Either way, we guarantee to offer you the highest prices in the industry. Just follow these simple instructions. ONLINE CLUB QUOTE. CLICK HERE to instantly receive the value of your golf clubs. Enter the club(s) you wish to sell us by utilizing our drop down menu. Continue the process and submit your order. BY FAX OR EMAIL. CLICK HERE to download our inventory quote form. Record your inventory and EITHER fax us back the form at 860-296-1662 OR email the form back to us at: purchasing@swingemagaingolf.com. Upon receipt, we will send you a confirmation and reply with values of your clubs to confirm the transaction. PHOTO QUOTE. Simply take a photo of the item(s) you would care to sell us and email them to us. If you have multiple items, you can take one large size photo of all the clubs together. We will need to see the heads and back cavity of the clubs to provide you with an accurate quote. BY PHONE. You may also contact our Purchasing Department directly at 866-600-7769 to receive a quote or assist you with the process. Create your free account on our website or contact our team to help you register, log in & start selling. Enter your club(s) specifications into our online Club Quote Engine to obtain values and submit your order. Once you input your order you are prompted to print your prepaid shipping labels which can be applied to your box of items and ship to us. QUOTE IS APPROVED BY PURCHASING DEPARTMENT. Contact our Purchasing Department to receive a quote on your items. RECEIVE PRE-PAID S/H LABELS & SHIP US YOUR ITEMS. We will send you prepaid shipping labels via email or the US Mail. Apply the labels to your boxed items and ship them to us. It's that easy! We know that you have a choice when it comes to selling your overstock and trade-ins. We are dedicated in becoming your trade-in partner and work diligently to exceed your expectations. We email you during the process to inform you once the order has been received and then again when your payment has been processed. For your convenience, we offer two payment options: Business Check and/or Pay Pal. All payments made to the golfing public who utilize our service to sell their excess golf clubs will be paid within two weeks of us recieving your clubs. When your clubs arrive at our warehouse, the transaction is processed and a confirmation notice will be emailed to you and then emailed again when your payment has been mailed. Shipping is FREE on any transaction that totals over $100.00. For transactions under $100.00 a $10 S/H fee will be deducted from your payment. OUR SERVICE WILL EXCEED YOUR EXPECTATIONS WHILE INCREASING YOUR SHOP'S SALES. WE LOOK FORWARD TO BECOMING YOUR TRADE-IN PARTNER. Copyright © 2003 - 2019 Swing'em Again Golf, LLC. All rights reserved.